After pressure from BDS, American singer and songwriter announces she will postpone Israel concert until she can also visit “Palestine”. “I believe all people, all of us, all of our brothers and sisters, all of our fragile globe, whatever their ethnicity or religion or nationality, deserve the same basic human rights under the law,” Roger Waters told the crowd at a Munich concert last week. Waters performed in Munich following a campaign to cancel his concert backed by the city’s mayor, Dieter Reiter, who accused Waters of anti-Semitism. An attorney for Waters asked Reiter to retract his statement, according to the Jerusalem Post, and Waters addressed the row himself from the stage at Munich’s Olympic Hall and later posted to social media. The musician explained that the mayor was championing a petition that alleged Waters is anti-Semitic because he endorses the Palestinian movement for Boycott, Divestment and Sanctions against Israel. Munich passed a law last year that prohibits the use of public facilities to persons who support the BDS movement. Netta Barzilai is an incredible talent and deserved to win Europe’s most important song competition. But her victory, even if inadvertently, is a victory for the occupation. I’m a huge fan of Netta Barzilai. I think she’s a rare musical genius. I was rooting for her as she was competing to represent Israel in this year’s Eurovision Song Contest. Late at night on Saturday, as votes from across Europe were coming in, I was sitting on the edge of my seat, yelling at each country that didn’t vote for her, eventually bursting out in joyous laughter as she won the popular vote and the entire contest. Politically speaking, however, Barzilai’s win is bad news. Our Eurovision victory proves that the Israeli right is correct. We can bomb Iranians in Syria as much as we want, push for the cancellation of an international nuclear agreement we are not even party to (and that most countries view as essential for world peace), open fire at journalists and nonviolent demonstrators, hold millions of people under a racist military regime for over half a century – and nothing bad will happen. On the contrary. Embassies are moving to Jerusalem, exports (especially of Israeli weapons) are up, and next year’s Eurovision competition will be held in the unified (read: occupied) Jerusalem. Once in a while we might hear the distant, choking sound of Palestinians, living under the boot of Israeli occupation, but it’s a noise one gets accustomed to. One can argue, of course, that the massive popular vote for Barzilai throughout Europe was neither a political statement in support of the occupation nor a message regarding the growing popularity of the authoritarian right across the continent. Rather, it was a genuine enthusiasm from her performance – and one that I share. While the Eurovision’s referee votes are highly politicized, ordinary fans of the competition likely voted for someone they recognized as a great singer – someone who sings about woman empowerment, and who pushes a progressive and liberal platform. But in the real world of politics, intentions are not enough. Israel’s hasbara (state-sponsored propaganda) has made an art of turning liberals into a living proof of our being “the only democracy in the Middle East.” Both the Ministry of Tourism and Ministry of Foreign Affairs regularly boast of Tel Aviv’s progressive politics and its and vibrant nightlife – with a stated goal of re-branding Israel and hiding away Jerusalem, with its religious zealousness and occupation. This is also the case now. As 972’s Orly Noy recently mentioned, Netta Barzilai represents the State of Israel. Both the government and opposition members in the Knesset have been celebrating her victory, saying that next year’s Eurovision will come to the “unified Jerusalem.” They know well that this is a national victory, not a private one. It is especially a victory for Prime Minister Benjamin Netanyahu, the “foreign relations wizard,” who is already using the latest news to promote both hasbara and his own political career. The coming year will most likely turn into a PR war between Israel and BDS activists throughout Europe. As the 2019 contest inches closer, the latter will most likely start campaigning in all 40-plus countries that send representatives to the competition, bringing up information about the occupation in general and Jerusalem in particular – and thus sparking political controversy. This will not likely stop the show, but the international debate will be of value in and of itself. Until then, it is up to Israelis like myself to keep fighting the occupation at home, to support Palestinian popular resistance, and in between – go party with the one and only, Netta Barzilai. Now THIS is a man of conviction! German public broadcasters have dropped plans to air concerts next year by ex-Pink Floyd musician Roger Waters, citing what they call “accusations of antisemitism against him”. Waters, part of one of the world’s most critically acclaimed and commercially successful rock bands from 1965 to 1985 before going solo, is a member of the Palestinian-led Boycott, Divestment and Sanctions movement (BDS) that targets Israel over its occupation of territories where Palestinians seek statehood. RBB, part of the ARD network, said it wanted to send a message to other artists who, heeding the BDS, refused to perform in Israel. Waters joined the movement in 2011. “The quick and decisive reaction by the broadcasters … is an important signal that rampant antisemitism against Israel has no place in Germany,” said Josef Schuster, president of the Central Council of Jews in Germany. Marek Lieberberg, Waters’s tour director, said German Jews were right to be concerned about “clearly visible and growing antisemitism” in Germany – alluding to the far right’s surge in recent German elections – but the broadcasters’ decision was “absolutely ridiculous”. Lieberberg, the son of Holocaust survivors, told the Mannheimer Morgen daily that while he rejected the BDS, he separated personal opinions from work. “I cannot and do not want to deny [Waters] his right to freedom of opinion,” he said. Israeli prime minister Benjamin Netanyahu’s rightwing government has long campaigned against the BDS, describing it as antisemitic and an attempt to erase Israel’s legitimacy. The movement – launched in 2005 as a non-violent campaign to press Israel to heed international law and end its occupation of territory held since a 1967 war – has gathered momentum in recent years even if its economic impact remains negligible. Germany has long sought to distance itself from the Nazi Holocaust and become one of Israel’s closest allies. Cave and his band, The Bad Seeds, played to sold-out crowds on Sunday and Monday in Tel Aviv. Prior to his concerts, Cave told a news conference that he was performing in Israel to take a stand against the Boycott, Divestment and Sanctions movement against Israel, or BDS. Waters has been active in urging fellow artists to boycott performing in the country. “Nick thinks this is about censorship of his music? What?” Waters wrote in a statement following Cave’s concerts in Israel. “Nick, with all due respect, your music is irrelevant to this issue. So is mine, so is Brian Eno’s, so is Beethoven’s. This isn’t about music – it’s about human rights. Eno, a British musician, also commented in a statement posted with Waters’ on the website of the Artists for Palestine organization. Proceeds from screenings of Ken Loach’s latest film ‘I, Daniel Blake’ are donated by the pro-boycott director to BDS’s UK branch, turning Israelis into unwitting supporters of a boycott against their own country. British director Ken Loach donated the proceeds from the screenings of his latest film in Israel to the anti-Israel Boycott, Divestment and Sanctions (BDS) movement. The film, “I, Daniel Blake,” was widely acclaimed and screened in front of audiences at packed theaters in Israel last spring. At the end of the week, the British branch of the boycott group published a statement revealing it had been the recipient of all proceeds from the film’s screening in Israel donated by Loach. “Ken Loach, thank you for the support and generosity, it gives us strength,” the organization’s members told the British director. They did not specify the amount they received from him. “I, Daniel Blake,” came out last year and won the Golden Palm Award at the Cannes Film Festival and the Best British Film award at the British Academy Film Awards (BAFTA), as well as being nominated and named best film in many other prestigious festivals. The film tells the story of Daniel Blake, a working-class man who was crushed under the weight of bureaucracy after suffering a heart attack and being denied benefits despite his inability to work, forming a unique friendship with a single mother in the process. The film’s director, Ken Loach, is considered to be one of the best directors working in Britain today. 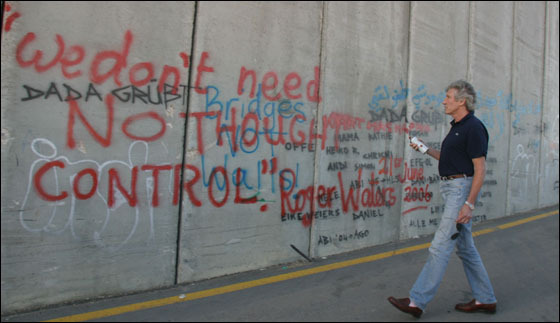 Alongside Roger Waters, Loach is also the most prominent supporter of BDS in Britain. Loach has signed numerous letters calling for a boycott of Israel and has even approached artists such as Radiohead demanding that they cancel their planned performances in Israel in the past. His efforts however, were to know avail with the show going ahead at full volume. “Do not appear in a country where there is an apartheid regime,” he repeatedly told various artists. Loach was heavily criticized last summer after reports revealed that, although he called for a boycott on Israel, he himself was profiting from screening his films there. Loach replied, through his producer Rebecca O’Brien, that the distribution company of “I, Daniel Blake,” signed a distribution agreement with Israel “accidentally” and without his knowledge. “We asked not to sell the film to Israel, but during the Cannes Festival, junior representatives from the production company quickly sold the film to Israel, forgetting that Ken had asked not to sell the film for screenings there,” O’Brien told The Guardian. As a result of the claimed error, the film was screened in Israel despite the fact that many viewers who watched it did not know that their money would now help BDS and its efforts to continue to defame Israel’s name abroad. Shani Films, which distributed the film in Israel, has yet to respond to the reports. Arriving in Israel to promote his new movie Norman, directed by Joseph Cedar and starring Israeli actor Lior Ashkenazi, Gere is uncertain as to how he will be received by the public given his recent comments on the political situation. Hollywood star Richard Gere is in Israel promoting his new movie Norman, by Israeli director Joseph Cedar. However, the question of how he will be received by the Israeli public is a matter of uncertainty.”In my past visits to Israel, I always heard all the viewpoints. Now it has become almost impossible. I know many people will not like what I have to say, but these are things that need to be said,” said Gere. “The occupation must end. The occupation is ruining everyone on both sides. A bi-national state won’t solve anything, and it will only turn Israel into an apartheid state. There needs to be two states for two peoples, with Jerusalem as the capital of both nations. Yesterday I joyfully posted that Coldplay was planning two concerts in Israel and Palestine, billed as two Peace Concerts ….. It was not true according to the group. On Monday, Israel’s Channel 2 News reported that the band would play two concerts in Israel, on November 3 and 4, 2017 that would be marketed as “human rights concerts” which will be dedicated to messages of peace and unity. On Tuesday, however, a representative for the band said the report was not true. Popular British rock band denies reports it is planning two “peace concerts” in Israel. Popular British rock band Coldplay on Tuesday denied reports that it was planning two “peace concerts” for Israelis and Palestinian Arabs this coming November, JTA reported. In addition, Channel 2 said, the audience at the two concerts will be comprised of both Israelis and Palestinian Arabs, with tickets for the shows to be sold in the Palestinian Authority as well as in Israel. Coldplay’s lead singer, Chris Martin, recently visited Israel and reportedly discussed the possibility of the band coming for a performance in Israel for the first time ever. Coldplay’s refusal to come to Israel has over the years produced rumors that its members do not want to come to Israel for political reasons, but Israeli producers stressed during Martin’s visit that the band vehemently denied the rumors in private conversations. In fact, in 2016 Coldplay collaborated with Israeli directors Vania Heymann and Gal Muggia who directed the award-winning video clip for the song Up&Up. The British rock band Coldplay will play two “peace concerts” for Israelis and Palestinians. The concerts, set for Nov. 3 and 4, will be performed at an outdoor location north of the Dead Sea, Israel’s Channel 2 reported Monday. The shows will aim to promote human rights and bring people together, The Times of Israel reported. The tickets — 50,000 for each concert — will be sold in Israel and the Palestinian territories. Coldplay, which has sold over 80 millions records worldwide, will arrive in Israel two weeks before the shows and record a song with Israeli and Palestinian artists. Few artists have attempted similar Middle East peace-themed concerts on this scale. Roger Waters, the former Pink Floyd frontman, played a concert in the Israeli Jewish-Muslim coexistence village Neve Shalom in 2006. He has since become a leading proponent of the Boycott, Divestment and Sanctions movement against Israel. Leonard Cohen made a failed attempt to play a concert in the Palestinian territories in 2009 while touring in Israel. Coldplay singer Chris Martin is currently the artistic director for the Global Citizen Festival, which is run by the Global Poverty Project, an organization devoted to ending extreme poverty by 2030. Two of Coldplay’s recent musicvideos were directed by Israelis. The band fronted by Chris Martin has come under fire after posting a link to a “Freedom for Palestine” video by the band OneWorld on their Facebook page. A theater in Sag Harbor, New York has offered to refund tickets to a sold-out performance by Roger Waters over his support of the Boycott, Divestment and Sanctions Movement against Israel. Waters, the former frontman of rock band Pink Floyd, has been vocal in his criticism of artists who perform in Israel. He is scheduled to perform Friday at the Bay Street Theater. Page Six reported Wednesday that the performance may face picketers in a protest organized by pro-Israel groups. Earlier this month, in a much-publicized rant, radio personality Howard Stern ripped Waters for his support of the movement to boycott Israel. Waters in an open letter to rocker Jon Bon Jovi ahead of his concert earlier this month in Israel, accused the artist of “standing shoulder to shoulder” with right-wing Israeli extremists. Waters has published open letters calling on fellow musicians to join a boycott of Israel. He has also come under fire for using at in his concerts a huge inflated balloon in the shape of a wild boar with a prominently visible Star of David among other symbols, including a dollar sign and a hammer and sickle. He had used the gimmick for several years. Having previously defended Roger Waters from accusations of anti-Semitism, the Anti-Defamation League (ADL) in 2013 reluctantly acknowledged that “anti-Semitic conspiracy theories” have “seeped into the totality” of the former Pink Floyd frontman’s views. NO PALESTINE? ~~ NO SHOW! The rapper Matisyahu was taken off the schedule of a Spanish Reggae festival due to his refusal to publicly support creation of a Palestinian state, Spanish media reports. Valencia’s Boycott, Divestment and Sanctions (BDS) movement requested that Rototom, the 22nd European Reggae Festival scheduled for 15-22 August in Benicàssim, cancel Matisyahu’s planned performance, stating that the Jewish-American rapper has “participated in pro-Zionist festivals and has said that Palestine does not exist”. Matisyahu is known for blending Orthodox Jewish themes with reggae, rock and hip hop beatboxing sounds. Rototom asked Mattisyahu to publicly state whether there is a right to a Palestinian state and whether he rejects Israeli military violence, particularly that during Israel’s summer 2014 attack on the Gaza Strip. “After having repeatedly sought dialogue (with Mattisyahu), the artist was unavailable to speak out clearly against the war and the Palestinians’ right to a state of their own. Accordingly, the Mattisyahu concert scheduled fot 22 August was cancelled.